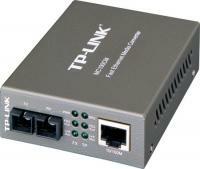 * Complies with 802.3u 10/100Base-TX, 100Base-FX standards. * Provide one SC fiber connector and one RJ-45 connector. * Auto negotiation of duplex mode on TX port. * Auto negotiation of 10/100Mbps and auto MID/MID-X for TX port. * Provide switch configuration of Half-Duplex / Full-Duplex transfer mode for FX port. * Extend fiber distance up to 2km. * Easy-to-view LED indicators provide status to monitor network activity easily. 3.7x 2.9 x 1.1 inch.